As I told you before I use a combination of mascara on my lashes. The combination changes every three months due to my mascara expiring. 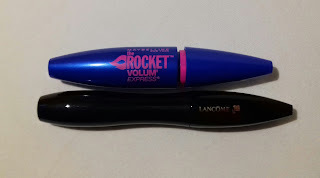 Right now I am using the combo of a Lancoôme and a Maybelline mascara as stated in the title of this blog post. Let's see what this combo does for my lashes! I reviewed both mascaras for you separately (Maybelline's (click), Lancôme's (click)), but how does the combination of the two work out? I start off with clean lashes. 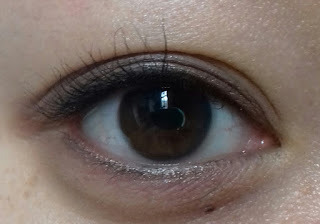 I am only wearing thin black liner a bit of eyeshadow along the upper and lower lash line. This is how my lashes look without any mascara. This is what my lashes look like with one coat of Hypnôse Drama. I only ran the brush once or twice through my lashes. It gives a nice natural effect. It makes my lashes appear a bit longer and gives them nice volume. I was feeling a bit dramatic and wanted my lashes to be at their best, so I applied two coats of Hypnoôse Drama. Most of the time when I am in a casual mood, one coat will do and I'll proceed to the next step. You can see how nice this mascara makes my lashes look and how beautiful the volume builds on my lashes. As the mascara is getting a bit dryer I love it more and more! 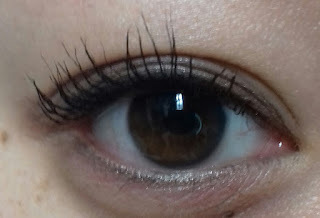 And this is how my lashes look with a final coat of the Rocket Volum' Express. I think it certainly adds something to it. 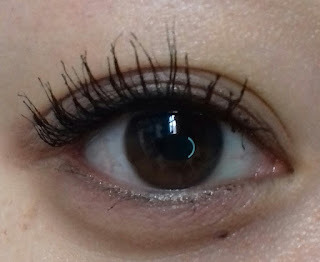 I can see that my lashes are more separated and that there is even more volume, especially at the roots of my lashes. I really love this combo, I mean, just look at my lashes! I think the Rocket Volum' Express is almost to it's end, it is really dry and if it dries up completely before I did this combo for three months, I'll be really sad. In my opinion using two different mascaras (for different purposes, like in this case one for volume, one for separation) really does make a difference and certainly does something extra for your lashes!